ATTiny85 with 74HC595 not matching ? > ATTiny85 with 74HC595 not matching ? I has been programming using UNO and my project working well. Then I try to switch to breadboard ATMega328P in TQFP is also working well. But I cant get my program to work on ATTiny85. The same program can run perfectly when I use ATMega328P-CU in TQFP. (Of course when i change to ATTiny, I have change the data, clock, latch pins according to ATTiny85 pin configuration). My program is just reading the variable resistors and shift out the output into two shift registers of 74HC595. Because i think the number of pins in ATTiny85 is sufficient to run this project, so I do not want to use excess pins in ATMega328P. The only different i thought is in ATTiny85, I cant have external crystal and I thought is the speed to slow, then I try burn bootloader for the ATTiny to 8MHz, it is still not working even though all upload is perfect. There is no errors. Could someone experience this tell me what is the different and how to get this work ? Re: ATTiny85 with 74HC595 not matching ? The error on line 131 of your sketch explains the behavior you described. Probably a bug in the code that compromises compatibility. Post the entire sketch (no snippets - it's never in the snippet you think it is). Also, what board package are you using to add support for the ATTiny85? Mine, or some other one? I attached the entire code. Which board package are you using to add support for ATTiny85? 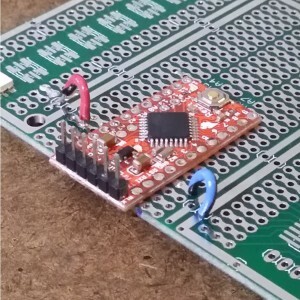 There are two currently maintained attiny board packages, plus dozens of abandoned versions around the internet, and they are NOT all the same. I have try naming with numerical number is still not working. Which attiny board package are you using??? 2) try to describe "not working"
3) try to isolate the problem: are you able to turn on/off simple LED? Are you able to shift (constant) data to the shift register? Are you able to read the ADC value properly? I am using ATTiny/UNO on board shield for ATTiny connected UNO. I can upload program and turn on LED with a simple blink program without issue. May be I shall breakdown the code to check the ADC value using serial monitor. I have not done that. Yes. I am using David Mellis core, but I dont know what version. I follow the instruction here. Now, I try to install the SpenceKonde core. But I during installation, I have error as below. I am not sure due to server issue or network issue. after downloaded, CRC mismatch error. Pls help. Can anyone else confirm whether this problem is happening for them? I can't test it until I get home late tonight. I went from version 1.1.4 to 1.1.3 and back to version 1.1.4 without a problem.